Grapes are unique fruits on planet having a number of anti-oxidants and polyphenols that prevent us from many types of cancers like mouth, pharynx, esophageal, pancreatic, prostate and colon etc. In red wine, resveratrol is present which is useful against heart diseases it is just a type of polyphenol available in the outer cover or skin of red grapes. It is a rich source of minerals like potassium, selenium, iron, phosphorus, magnesium folates and vitamins like Vitamin A, Vitamin C and Vitamin B6. Grapes are very healthy fruits as they contain flavonoids that are very strong anti-oxidants, that causes removal of free radicals from the body resulting in reduction in the risk of cancer and other major diseases. Manganese is a very essential component for our body as it is important for every important function like collagen formation, nervous system functioning, protein metabolism. Calcium is also available in grapes that are helpful for bone development. Regular intake of grapes with our diet is useful for prevention of aging conditions like osteoporosis. Grapes contain a high content of hydrating power which provide moisture and relaxation to the lungs and relieve from asthma. Grapes prevent formation of blood clots in the body as it increases the nitric oxide levels in the blood. resveratrol and quercetin, remove the effect of free radicals and toxins from the body. Grapes are considered as light food so it helps in digestion and remove stomach problems. As Vitamin C rich fruit it also improves metabolism and relieves indigestion. Grapes contain a wide range of cellulose, organic acid and sugars that help to relax the stomach and intestinal muscles, hence help to get rid of constipation. Grape juice is considered as the best remedy for migraine. It should be taken early in the morning without water. It contains a big number of antioxidants and nutrients that cure migraine. Grapes are full of anti-oxidants and vitamins so it keeps our skin fresh, healthy, tight and free of acne. Regular intake of grapes brings brightening glow in the skin. Grape juice has anti-microbial and anti-bacterial activity it protects from microbial and fungal infections. Grape juice contains a compound known as pterostilbene that is used to lower the blood cholesterol. Outer skin of grapes contains saponin which helps to prevent clots from blood vessels. 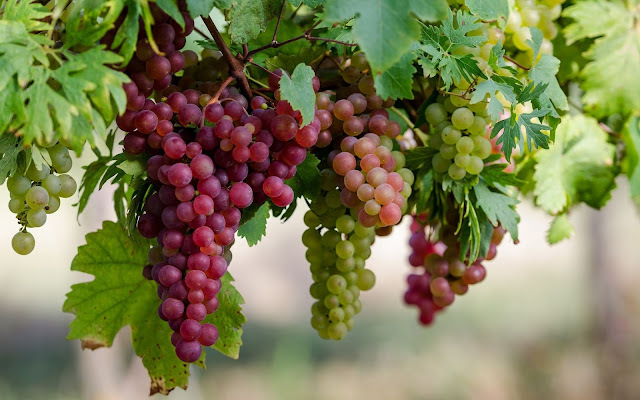 Grapes not only contain minerals and fibers it also contain high quantity of vitamins like vitamin A, vitamin C and vitamin K so it boosts immune system also helps the body to prevent from cold. Grapes also have number of benefits for our hair. It is full of nutrition and full treatment for hair fall; it removes dead hairs and brings shine. Because of its anti inflammatory properties it reduces the risk of cancer. Anthocyanins and pro-anthocyanidins are the agents present in grapes that reduce the growth of cancer causing cells. Many people also use home remedies; they store and then dried the grapes known as raisins to cure many ailments like asthma, fever, acidosis, sexual dysfunction and general weakness. Fatigue and tiredness is usually due to anemia and anemia is the major issue in many people because of low hemoglobin levels. Grapes contain folates and iron which prevents from anemia and keep people active. It also helps in healing kidney disorders and improves the kidney function. Although grapes are full of nutrition it is small in size low in calories. One cup of grapes contains 100 calories. People use grapes as a snack so doubling of calories occur which lead to excessive weight gain. Some people have severe allergy from grapes. For such people even touching grapes may trigger allergies like rash, redness, sneezing and vomiting etc. Carbohydrates are necessary for our body. Carbohydrates are converted to glucose in the body, body consumes 45-60% of these carbohydrates. Excessive intake of grapes increases the amount of carbohydrates in the body. Eating excess of grapes may cause nauseas and stomach discomfort. As grapes contain excess of fiber which is sometime difficult to digest and cause nausea and vomiting. Grapes do not provide side effects in moderate amount but having grapes in excess amount can cause some difficulties. Suggested Product: The Super Fat Burning - Anti-Aging Foods.